Looking for a book, DVD, CD, or other item? 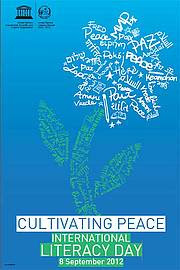 Search our catalog! from "The Pirates' Code of Conduct"
A few of the tenets of piracy as poetically expressed by Shiver Me Timbers! Pirate Poems and Paintings by Douglas Florian, with illustrations by Robert Neubecker [J 811.54 FLO]. Then tied the braids with bows. He stuffed burning rope beneath his hat. Put a ring right through his nose. To pillage and plunder and steal. Which he did his best to conceal. A pirate as cruel as they come. But he always wrote home to his mum. Neubecker's paintings are bright, his pirates are multi-cultural, and, his humorous details are marvelous! If you don't want to be fed to the fish, you'd better sail over to Paper Tigers for the Poetry Friday Round-Up. If you're a regular classic mysteries fan, you should check out the website, Classic Mysteries, for "Podcasts and conversations about fine detective stories worth reading and re-reading." Yesterday I briefly mentioned a blog page called Nutfield Genealogy, which is specific to this portion of New Hampshire, formerly known as Nutfield. I thought that today I'd let you know about some of the new books on genealogy that we've recently added to our circulating collection. The other day, while on our Facebook page, I accidentally clicked on something that redirected me to a site called, Nutfield Genealogy. 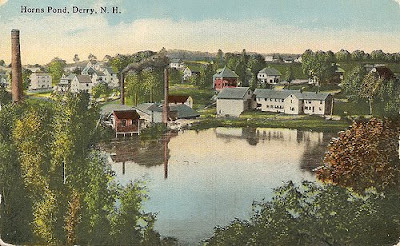 Nutfield was once the name applied to the towns of Londonderry, Derry, and Windham! The site was one of 2011's Family Tree Magazine's top 40 genealogy blogs, and has a lot of posts that may be of interest to Windham residents. If you have ancestors from this area, we've got Willey's Book of Nutfield: A History of That Part of New Hampshire Comprised Within the Limits of the Old Township of Londonderry, From Its Settlement in 1719 to the Present Time by George F. Willey [R 974.2 NUT] and Glimpses of Derry, New Hampshire, 1719-1969 by the 250th Nutfield Anniversary Committee [R 974.2 DER], both titles are on our reference shelves. Postcard courtesy Derry Public Library. I find this a little hard to believe, "Renaming Fruits And Vegetables With Catchy Names Convinces Kids To Eat Them, Study Says", but, then again, who would have thought that these two books would be best sellers a few years back: Deceptively Delicious: Simple Secrets to Get Your Kids Eating Good Foods by Jessica Seinfeld [641.5622 SEI] and The Sneaky Chef: Simple Strategies For Hiding Healthy Foods in Kids' Favorite Meals by Missy Chase Lapine [641.5622 LAP]. We also have books touting the merits of making food more appealing by turning it into art! 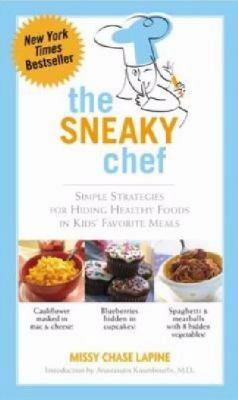 Look for Cool Fruit & Veggie Food Art: Easy Recipes That Make Food Fun to Eat! 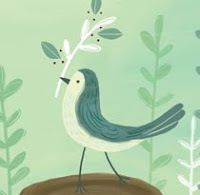 by Nancy Tuminelly [J 641.58 TUM]. I guess we've come a long way from the days when kids had to eat their vegetables or they wouldn't get dessert. Renee at No Water River is hosting the Poetry Friday Round-Up for today. My birthday is coming up. Here at the library, tradition has it that each birthday person brings in a cake or other goodie to share. This year, although it is a few days early, I purchased a GIANT (4 1/2 lbs.) whoopie pie. You should have seen the expressions on each staff member's face as the whoopie pie box was opened! The picture is what's left after the staff's first snack attack! The coffee cup is next to it for scale. If you'd like to try baking your own whoopie pies, pick up our copy of Whoopie Pies: Dozens of Mix 'Em, Match 'em, Eat 'em Up Recipes by Sarah Billingsley [641.8654 BIL]. The photos below were taken by me at the fair. Photos © Diane Mayr, all rights reserved. In the olden days, that is, before the internet, you passed along household hints by word of mouth or through hints sections of newspapers and magazines. There were also books on library shelves such as Hints from Heloise, which was a compilation of hints taken from a newspaper column of the same name. Today, you browse Pinterest boards or blogs and can become overwhelmed by advice. Books just might be the way to go--at least you know that there is a limit to the information, and that theoretically, an editor and a team of fact-checkers, reviewed the information for accuracy. 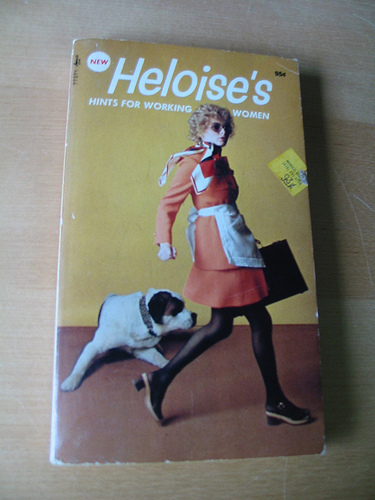 Household hint books still exist, although they look vastly different from the original Heloise books, and are often written with tongue planted firmly in cheek. 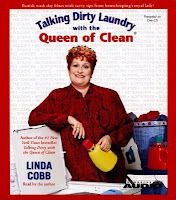 On our shelves we have Talking Dirty with the Queen of Clean and Talking Dirty Laundry with the Queen of Clean by Linda Cobb [648.5 COB] and Haley's Cleaning Hints by Graham Haley [648.5 HAL], to name just two. Photo of 1972 Heloise book by Ann Douglas. Last month during the Olympics we saw many different flags, and it got me to thinking about flags and the fact that ours has remained basically the same since Alaska and Hawaii became states in 1959. The 49th and 50th stars were added at that time. 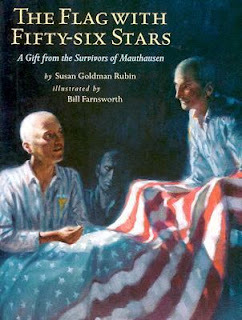 In our children's section, we have an interesting book, The Flag with Fifty-Six Stars: A Gift from the Survivors of Mauthausen by Susan Goldman Rubin [J 940.5318 RUB . a narrative description of the events of May 6, 1945, when members of the U.S. Army marched into the Mauthausen concentration camp during World War II, and were presented with a makeshift United States flag by a group of prisoners of war. Fifty-six stars? You'll have to pick up the book for the story! When kids do nations-of-the-world reports, they often are required to find the picture of a national flag. Flags of the World can provide your child with the needed information, or, browse through one of books, such as the Smithsonian handbook, Flags [929.9 FLA]. What's not to like about a cat poem? Here's a touching one by Ruth Stone from In the Next Galaxy [811.54 STO]. in a dime store photograph. The children no longer visit. a lock. She picks him up. The porch screen has been mended. He thinks there are the old openings. out of the flecked light. 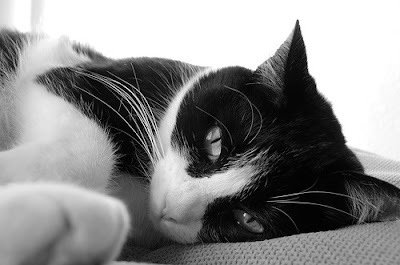 I'm taking the day off today so that I can host the Poetry Friday Round-Up at Random Noodling. See you there, and see you back here on Monday! A brand new addition to our collection is Furoshiki: The Art of Wrapping with Fabric by Kumiko Nakayama-Geraerts, it is currently being cataloged and processed, so look for it to appear on our shelves in the near future. New parents (or grandparents) may be interested in Baby-gami: Baby Wrapping for Beginners by Andrea Sarvady [649.122 SAR]. We also have several books in our collection that cover other Japanese fabric arts including Omiyage: Handmade Gifts in Fabric in the Japanese Tradition by Kumiko Sudo [746.0952 SUD] and Wagashi: Handcrafted Fashion Art from Japan, also by Sudo [741.672 SUD]. If you are particularly interested in Japanese fabric art, Kumiko Sudo has several other books available through the GMILCS consortium. If you're a visual learner, you may find it hard to keep up with all the political rhetoric of the 2012 elections. There is a place where you can go to see political ideas expressed in infographics: Visual.ly. The site's tagline states that it "empowers people to tell stories with data." As an organization that both practices and recognizes quality data-journalism, Visual.ly subscribes to the code of ethics of the Society of Professional Journalists and agrees to abide by all of its principles. Data will be accurate and verifiable - Visual.ly will not "lie with statistics." Proper Sourcing & Attribution - Visual.ly will always give credit where due and will do its own reporting. Best Practices in Visual Representation - Visual.ly will not exploit idiosyncrasies of the human visual system to exaggerate or misrepresent data. Most succinctly stated, Visual.ly's policy is one that encompasses accuracy, honesty, and transparency. While Visual.ly will do our best to promote these standards, the policy applies only to the visualizations we create ourselves and those we feature as staff picks, not to those uploaded by members of the community. So, always check to see if the creator of the infographic is a source you can trust! You can view the infographics on political subjects by clicking here. by mikewirth. Learn about data visualization software. Infographics is being used by businesses to use to attract and keep customers. To learn about this evolving business tool look for Infographics: The Power of Visual Storytelling by Jason Lankow, Ross Crooks, and Josh Ritchie. 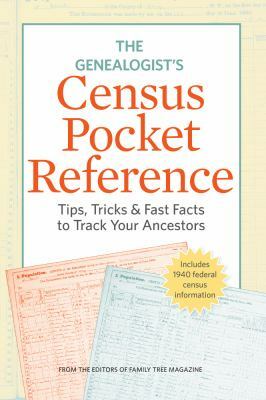 Since it was published just last week, it is not yet on our shelves, but it is on order so look for Infographics to arrive soon! Interested in making infographics and looking for data? Head over to Data.gov, "An Official Web Site of the United States Government." Today marks the 11th year since the attacks on the World Trade Center and the Pentagon. It will always be a solemn occasion for those who are old enough to remember. 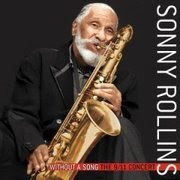 Four days after September 11, musician Sonny Rollins performed in Boston. Without a Song: The 9/11 Concert [CD JAZZ ROL], was recorded and released on CD in 2005. You can listen to a review of the concert CD here. Today is also primary day in New Hampshire. I can't think of a better day to exercise your right to vote than on September 11. Turning out to vote is a way of actively participating in our democratic process, and is a way to show the rest of the world, including those who wish us harm, that we have an engaged citizenry. Cast your vote! There are any number of reasons for not getting enough exercise into your life, but one of them shouldn't be you're stuck in a chair all day! Whether or not you're at work, or if you aren't fully mobile, you can work some exercise into your day. From books--Stretching in the Office by Bob Anderson [613.71 AND]--to videos--Chair Dancing Around the World [DVD 613.71 CHA]--we've got inspiration for you, so get moving! Literacy is a fundamental human right and the foundation for lifelong learning. It is fully essential to social and human development in its ability to transform lives. For individuals, families, and societies alike, it is an instrument of empowerment to improve one’s health, one’s income, and one’s relationship with the world. To learn more about the importance of literacy, look for The Power of Reading: Insights from the Research by Stephen Krashen [028 KRA], and for parents, we have Growing a Reader from Birth: Your Child's Path from Language to Literacy by Diane McGuinness [FT 372.4 MCG]. Let's celebrate International Literacy Day a day early--we'll do it with poetry! we read "I see cat." Another poem, with a more adult point of view, was published in The New Yorker, January 19, 2009. It is titled, quite simply, "Learning to Read," and was written by Franz Wright. Write. Sketch. Repeat. is the place for more poetry this week! Head on over for the Round-Up! Back in July, on the NPR food blog, The Salt, there was a post with an intriguing title, "Long Before Social Networking, Community Cookbooks Ruled The Stove." ...more than 3,000 charity cookbooks were published between 1864 and 1922, according to Feeding America, an historic cookbook project of Michigan State University. 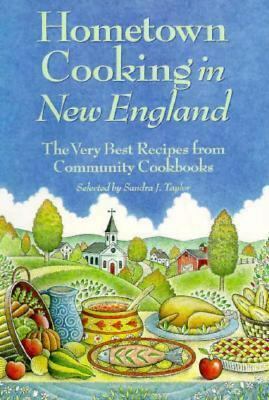 For even more community recipes, there's a cookbook that has put together the best of many community cookbooks: Hometown Cooking in New England: The Very Best Recipes from Community Cookbooks [641.5974 HOM]. One of the hot issues in this year's presidential election is Social Security. Social Security as signed into law in 1935. At that time it was supported by both major parties and was passed overwhelmingly in both chambers of Congress (House: 372 yes, 33 no, 27 not present or not voting. Senate: 78 yes, 6 no, 12 not voting.) For a look at the fascinating year during which Social Security was voted upon, 1935, check out The Defining Moment: FDR's Hundred Days and the Triumph of Hope by Jonathan Alter [B ROO}. Fast forward to 2012 and you'll find things have changed. We can never insure one hundred percent of the population against one hundred percent of the hazards and vicissitudes of life, but we have tried to frame a law which will give some measure of protection to the average citizen and to his family against the loss of a job and against poverty-ridden old age. Design for the original card courtesy Social Security Administration. A few weeks back I did a post on free online college courses. Today, I'm going to tell you about another free online educational resource: Open Culture. Open Culture bills its offerings as, "The best free cultural & educational media on the web." I have no way of testing that claim, but I do know they have lots of stuff! You can find audiobooks, courses, movies, language instruction, ebooks, and textbooks! 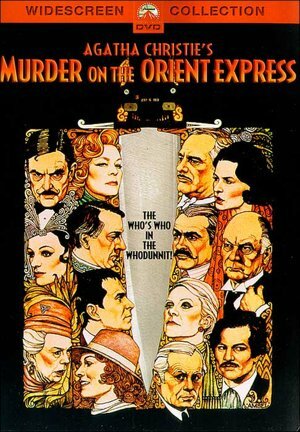 And, the site is also a blog where the reader is introduced to various media items. If you don't know much about music, borrow An ABC of Music: A Short Practical Guide to the Basic Essentials of Rudiments, Harmony, and Form by Imorgen Holst [781 HOL] and you'll be on your way to understanding the video you just watched! More Johannes Sebastian Bach music can be found in CD CLASSICAL BAC. 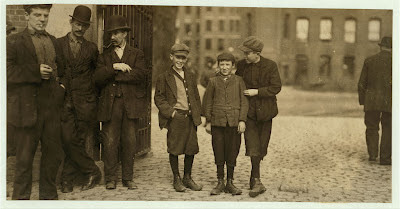 Working as an investigative photographer for the National Child Labor Committee (NCLC), Lewis Hine (1874-1940) documented working and living conditions of children in the United States between 1908 and 1924. 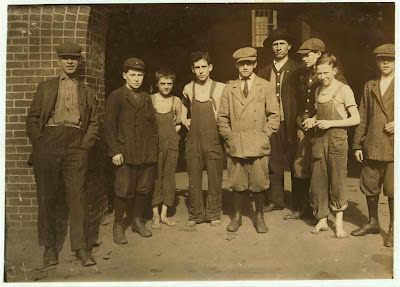 The NCLC photos are useful for the study of labor, reform movements, children, working class families, education, public health, urban and rural housing conditions, industrial and agricultural sites, and other aspects of urban and rural life in America in the early twentieth century. 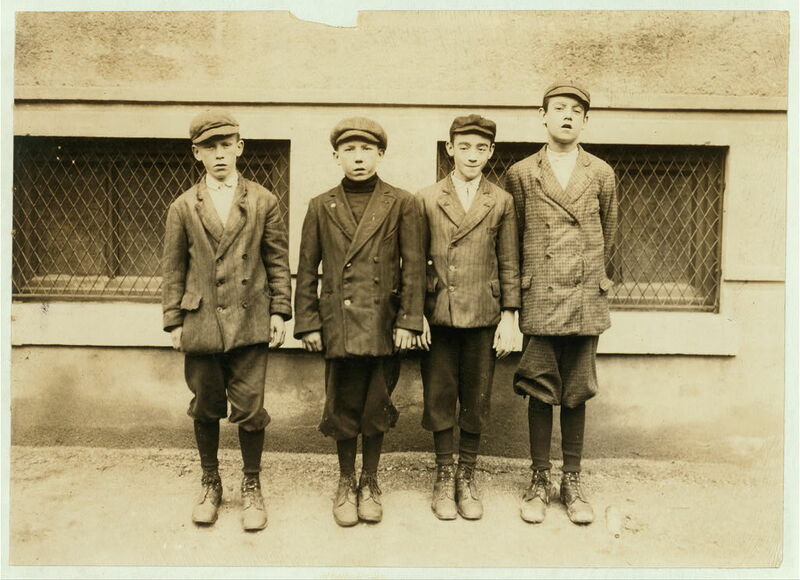 Robert Magee (smallest), 270 Suffolk St., apparently 12 years, been working in Mule Room #1 Merrimac Mill, Lowell, one year. Michael Keefe (next in size) 32 Marion St., been at work in #1 Mule Room, Merrimac Mill, Lowell, for eight months; apparently 13 years old. Cornelius Hurley, 298 Adams St., been at work in #1 Mule Room, Merrimac Mill, Lowell, for six months; about 13 or 14 probably. On left end of picture is Thomas Kelley, 275 Lakeview Avenue, has been doffing in lower spinning room No. 2 for one month. Appears 12 or 13 years. Next to Thomas are Patrick and Walter. (See 2588). Next to right end is Luke Gray, see 2589. Right end John O'Donnell, 8 or 9, been doffing in spinning room No. 1 over a year. Is over grown but may be 13. Joseph Boucher, 472 Moody, smallest boy in picture, appears 12 years old. Works in the mill-room. His father is boss of another room. Frank Matley next in right end of picture lives at 25 Rod St., been in mill-room No. 12 for 1 1/2 years. 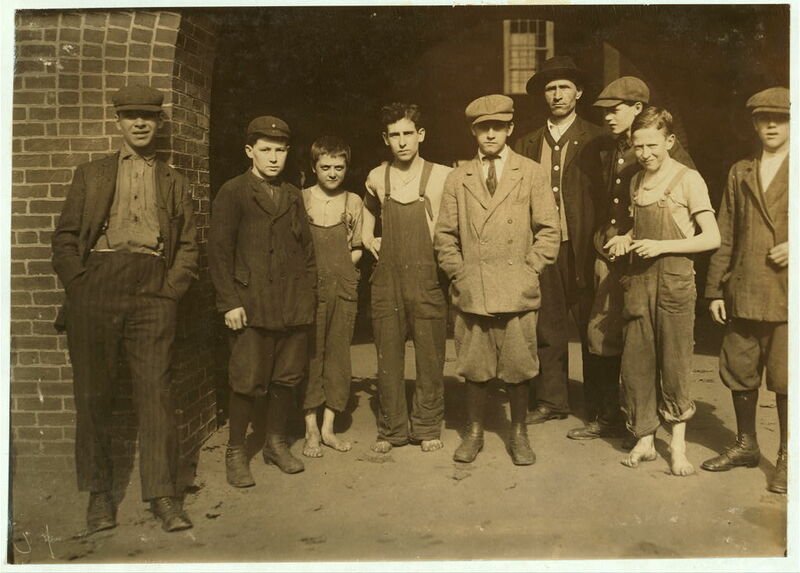 You can see other Hine photos in Kids at Work: Lewis Hine and the Crusade against Child Labor by Russell Freedman [J 331.3 FRE], Men at Work: Photographic Studies of Modern Men and Machines [779 HIN], and Women at Work: 153 Photographs [779 HIN]. Visit Nesmith's profile on Pinterest. 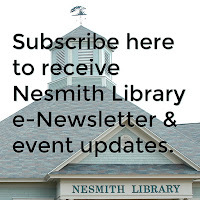 Adult Services Librarian/Assistant Director at the Nesmith Library in Windham, NH. Also masquerades as the children's writer, Diane Mayr. According to the National Institute for Literacy, success in school—and life—starts with literacy. When children become good readers in the early grades, they are more likely to become better learners throughout their school years and beyond. Neither Kurious Kitty, nor the Nesmith Library, are responsible for the content of external internet sites. Unless otherwise credited, photos used on this site were taken by me, a co-worker, or are used courtesy the Library of Congress other public domain sites. Clipart, unless otherwise credited, is courtesy FCIT or from public domain sources.